In 12-inch skillet, heat oil over medium-high heat. Add onions and garlic; cook 4 to 5 minutes, stirring frequently, until onions are softened. Stir in chili powder, cumin, salt, pepper and beef. Cook 6 to 8 minutes, stirring occasionally, until beef is lightly browned. 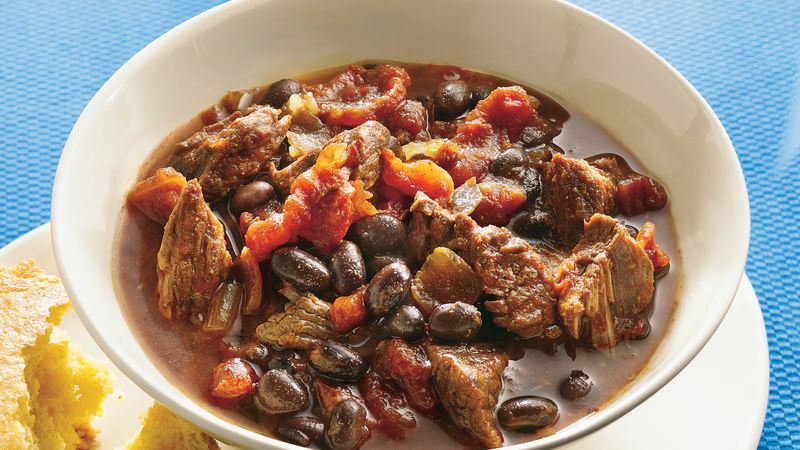 In 3- to 4-quart slow cooker, place beef mixture. Stir in beans, tomatoes and water. If you're not a fan of black beans, kidney beans are a great substitute. Packages of stew meat can have pieces of different sizes. Cut any large pieces into smaller same-size pieces so that everything cooks in the same amount of time.